But, seriously, there are some positive, along with the negative, aspects of this new product offering. Last Friday, Microsoft released Windows Live Events. After completing my review of this new web product, which is clearly aligned to compete with the likes of Evite, mypunchbowl, Renkoo, as well as many others, I came away with mixed feelings about its future, and some solid observations of user experience that I feel everyone can benefit from hearing and thinking about, as well as apply to other projects to create more successful web products. The User Interfaces start out well. The initial visual presents a simple, cohesive overview, easy to find and click primary actions, summaries, all with just the right amount of detail. An especially nice section of the interface, are the huge buttons, along the top, dedicated to the most frequent event related actions — nice and easy: inviting guests, tweaking event details, communicating and sharing — all relevant to the event. I found it difficult to clearly classify the parts of the page that are for sharing and socializing entirely with the Good or Bad parts section of this post. My imagination (or was it my hopes?) got the best of me when I saw the parts for blogging, discussions, and picture sharing. Is ‘Blog about this event’ going to really let me connect this to my blog (powered by WordPress) or other blogs out there? Will I be able to ‘Share photos’ on Flickr? ‘Discussion,’ that will be a fun way to quickly coordinate and keep track of everything. The social and communication components of the page contain considerable promise. These components provide some nice, and fairly easy to access (blogging and calendar integration are somewhat buried) features. 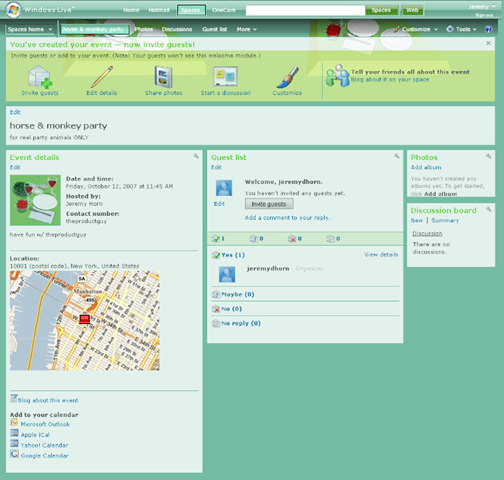 The _layout_ of the page definitely encourages the sharing of event related photos and group discussions. While my findings did not live up to my expectations, one can hope that some day they do, and, at least, they are a good start to integrating with a social community, even if it is Microsoft-only, for now. In Part 2 of my discussion of Windows Live Events I will delve into the negatives and other universally applicable product lessons. Интересно. Вообще чтение вашего блога это не просто глупое пролистывание последних новостей или чтениевсякой фигни про то, чем человек сегодня занимался, а нахождение реально занимательной информации. Next Entry Microsoft’s Mistakes. You too can learn from them.